WINTERSMITH was, most of all, a fun read. It was funny throughout, made me laugh out loud, had great characters, and was exactly was I was looking for. I had a great time returning to this book and I really enjoyed reading it. If you haven't read the first two Tiffany Aching books (The Wee Free Men and A Hat Full of Sky), you will likely miss out on a few of the jokes and a lot of the references, but it's not too difficult to pick up the story just from Wintersmith. It works as a stand-alone, but when you finish, you'll be looking for more of Tiffany's adventures. 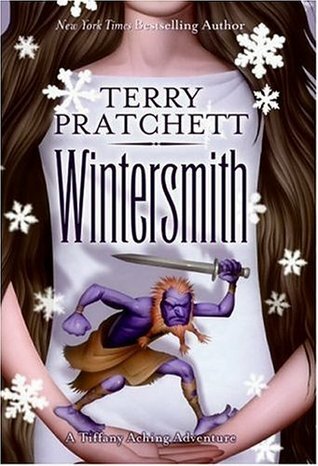 The first time I read Wintersmith, I thought it was a standalone and I had no trouble with it at all. All of the characters are wonderful and unique, from Tiffany to Miss Treason, and from Granny Weatherwax to the Wintersmith himself. Although it's much easier to appreciate all the quirks of each character and how developed they all were if you'd read the previous books, again, it is not at all necessary. Everyone is plenty fun in Wintersmith alone. This time around I paid much more attention to the character of the Wintersmith. I had never found him all that interesting before, just another character in the story, but now he stands out to me as one of the most interesting characters. He spends much of the story trying to find out what makes someone human, as he is trying to become human himself, as to catch Tiffany's affections (It's kind of a long story - you just have to read the book). I also liked the parts where Tiffany helped Miss Treason and Nanny Ogg with their "witchcraft" in the villages they took care of. The witches, rather than doing fancy magic *ahem*Annagramma*ahem* were in charge of taking care of people, and helping out where help was needed. Another of my new favorite scenes was when Tiffany and Nanny Ogg went to visit the man with all the traps for death. I'm not even sure why I like it so much, but it's the one I keep thinking back on. And of course, no review would be complete without mention of out favorite Wee Free Men. The Feegles are the source of much amusement and are as funny as ever on the reread. Wintersmith, as with the other Tiffany Aching books, begins with a Feegle Glossary, adjusted for those of a delicate disposition, which includes such entries as "Boggin': To be desperate, as in 'I'm boggin' for a cup of tea,'" "Cack yer kecks: Er, to put it delicately... to be very, very frightened. As it were," and "Ships: Wooly things that eat grass and go baa. Easily confused with the other kind." Happily, Rob Anybody, Daft Wullie, Billy Bigchin, and the whole Feegle gang play quite a large part in Wintersmith. 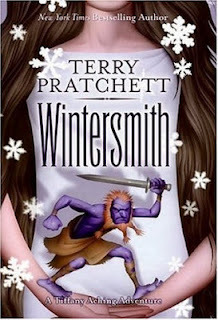 Wintersmith was lots of fun, with plenty of humor, and great characters to keep the story moving. I am looking forward to rereading the first two Tiffany Aching books. Ah, this series cracks me up! Terry Pratchett is such a terrific writer. My favorite of his books is NATION. You do know there's a fourth book, right? I SHALL WEAR MIDNIGHT? Also good times. The Tiffany Aching books rock -- it made me smile to see this review here.